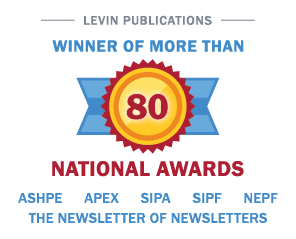 Norwalk, CT – May 28, 2009 –The SeniorCare Investor has earned several top editorial awards, including the 2009 Gold Award for “Best Publication of the Year: Newsletter” by the prestigious American Society of Healthcare Publication Editors (ASHPE). “Stephen M. Monroe, the editor, has covered this recession resistant market for close to 25 years. He does an excellent job. Steve Monroe has unrivaled access to the top senior care and housing players around the country and an uncanny ability to uncover highly proprietary information and breaking news. This ‘must read’ newsletter brings readers inside the tight-knit world of senior care and senior housing investments. It is a private world that few understand,” said Eleanor B. Meredith, publisher of The SeniorCare Investor. “Steve Monroe combines an uncanny ability to uncover highly proprietary financial information with a strong analytic mind honed from his own extensive financial background. It is quite a testament to his editorial savvy to receive such a prestigious award in this highly competitive medical publishing field,” said Eleanor B. Meredith. In addition to winning “Best Publication of the Year: Newsletter”, the publication also won the 2009 Gold Award For “Best Single Issue: Newsletter.” In the last five years, The SeniorCare Investor has won multiple awards that illustrate how a strong publication can successfully expand into other mediums. The interactive blog and audio conference series entitled “Conversations with Industry Leaders” have won numerous first place awards by the American Society of Healthcare Publication Editors, The Specialized Information Publishers Association and The Newsletter on Newsletters. The SeniorCare Investor is published by Irving Levin Associates, Inc., headquartered in Norwalk, CT. To contact the company, call 203-846-6800.